It was great to see everyone at the Innovate Baltimore June social. With over 150 professionals in attendance, it was a great and rewarding experience. Photos of the event taken by Brian Schneider can be seen here. I want to thank our generous sponsors, Cyberguys.biz, Clearwire, and Red Maple for making the evening possible. 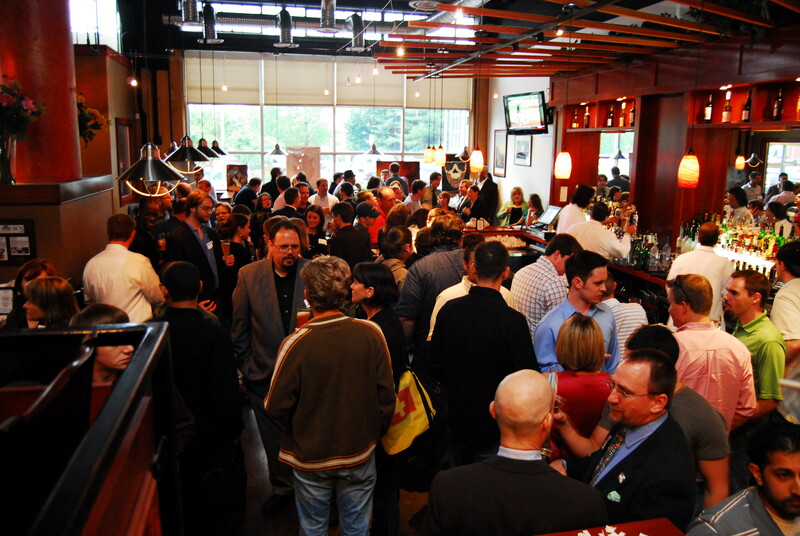 Stay tuned for details on the next Innovate Baltimore social will in August. In the meantime, please check out BetaScape, a three-day series of demonstrations, exhibits, workshops, and social events focused on innovative, cutting edge, and experimental technology at Artscape this July 16-18. Innovate Baltimore is curating the BetaScape Arcade and Video Game Showcase, as well as, throwing “Geek Chic”, a party featuring bands that cover music from video games on Saturday, July 17th. If you’d like to learn more about the BetaScape events and exhibits or how you can become involved, please visit www.betascape.org. We’d love to hear what you look for in networking events so we can continue to improve Innovate Baltimore benefits and services to the community. Please contact us at contact@innovatebaltimore.com. Thank you for your continued support in growing Innovate Baltimore. Working together, we can continue to build the creative technology sector of the Baltimore region. Thank you to everyone who came out to the Innovate Baltimore May networking social. We had a great turnout with over 130 people at Langermann’s for the event; it was great seeing the energy and excitement in the room. I’ve already heard from a few of you how much fun it was and how great the people in the group are. I have to agree, you guys are great. Please continue sending me your comments, both positive and negative, so that we can improve the services that we are offering. If you haven’t already done so, please check out Innovate Love which is this Saturday at Silo Point (www.innovate-love.com). It is a fundraiser being hosted by Innovate Baltimore and the Baltimore Love Project in Silo Point’s luxury penthouse. The main attraction is a silent art auction featuring over 40 works from top artists around the country, many of them from Baltimore. This is the first and only time that all of these pieces will be shown together. Super Art Fight will be painting a live mural while DJ Terry Thompson plays the music. Our drink sponsors are Flying Dog Brewery, The Raven Beer, and 13.5% Wine Bar. Chef “Mookie” Hicks is preparing a special menu of appetizers paired with the Flying Dog Ales which includes “Chocolate Porter Wings”. Tickets are only $25 and include a limited edition giclee print of our title piece by Whitney Sherman, hors d’ouevres, and the best view of the city. This is going to be one of those talked about events that you don’t want to miss. Cocktail attire is suggested. We appreciate everyone’s continued support in growing Innovate Baltimore. Working together, we can continue to grow Baltimore’s creative technology sector. Thank you to everyone who attended the March Innovate Baltimore social. With over 120 professionals in attendance and gorgeous weather, it was a rocking event. We’d love to hear feedback about what people look for in networking events and how we can improve the services that Innovate Baltimore provides to the community. Please email your suggestions to contact@innovatebaltimore.com. Thank you to everyone who attended the first Innovate Baltimore social of 2010. We hope that you had fun and found it to be a rewarding experience. Photos are courtesy of Innovate Baltimore partners Tom McConlogue and Ibrahim Dabo of Ib’s blog. You can read a great write-up of the event at Ib’s blog here. Thank you to everyone who braved a cold and rainy Veteran’s Day to attend the Innovate Baltimore November event at the Gin Mill. We counted over a hundred attendees and were pleased to see many returning and new faces, representing the Baltimore area movers and shakers. Photos are courtesy of Innovate Baltimore partners Jeff Tong (check out his Facebook photo sharing app Diditz! ), Ruben S. Brown and Tom McConlogue, and Gabriel Pendelton of Baltimore Gamer. Thank you to everyone who came out to Innovate Baltimore’s first event at the Gin Mill to help make it a smashing success. Photos are courtesy of partners Ruben S. Brown and Tom McConlogue, and Gabriel Pendelton of Baltimore Gamer.